This is Part 2 of a series on Kinesiology Tape. Read Part 1 Here & Part 3 Here. Part 1 of this series focused on the basics of kinesiology tape: its properties, underlying theories, and clinical evidence. In Part 2, we’ll cover indications (when you can/should use it), contraindications (when you shouldn’t), and some basics about when and how to use kinesiology tape. Let’s start off by reviewing some common myths or misconceptions about kinesiology tape. As with any popular health or sports product, confusion and misinformation surround kinesiology tape and its real or perceived benefits. Below are a few common myths or misconceptions about kinesiology tape, followed by evidence-based responses. All references are linked to at the bottom of this page for further reading. Myth: Kinesiology tape can heal or fix tendon, ligament, or joint injuries. Fact: Kinesiology tape can provide neurological input to reduce pain and can provide stability for injured joints, however kinesiology tape on its own does not heal or fix injuries   . Myth: Kinesiology tape acts as merely a placebo. Fact: Kinesiology tape has been clinically proven to affect physiological changes in both EMG and objective assessments     . Myth: Kinesiology tape is difficult to apply. Fact: With proper education and training, patients & clients can learn to apply tape themselves . Myth: The color of the tape matters. Fact: The color of the tape doe not matter . Myth: Kinesiology tape is a cure-all. Fact: Kinesiology tape acts as a temporary and assistive treatment to aid in the recovery process. It should be used as an adjunct to routine physical rehabilitation    . Like all other healthcare products, kinesiology tape will not fix every problem out there. When used appropriately, kinesiology tape provides acute and short-term pain relief, beneficial neuromuscular and proprioceptive effects, and edema reduction. Therapists and trainers should take the time to learn when to use it and when to avoid or discontinue use of it in order to get the best outcomes for their clients. Now that we understand the clinically proven effects of kinesiology tape, when should —or should’t— we use it with our patients, athletes, or even ourselves? Let’s begin with contraindications —or instances where kinesiology tape should not be used. Understanding the effects kinesiology tape has on circulation and lymph flow, many of the contraindications involve instances where increasing circulation or lymph flow would be harmful. Examples would include: DVT (deep vein thrombosis), kidney dysfunction (renal insufficiency), congestive heart failure (CHF), infection, and cancer. Of course, it should go without saying, that kinesiology taping should be avoided in instances where open wounds or damaged/irritated skin exist. When it comes to precautions, it is important to understand that a precaution is not the same as a contraindication. 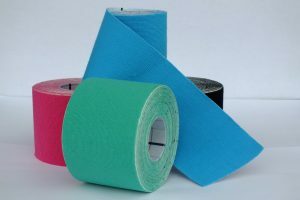 The presence of a precaution does not necessarily mean that a therapist or athletic trainer should avoid applying kinesiology tape to a specific area. It simply means that the practitioner should fully understand the situation and possible complications that may arise from using kinesiology tape. An example of a precaution for the use of kinesiology tape is lymph node removal. If a patient or client has had lymph nodes removed from a specific area, and the therapist or athletic trainer wants to use kinesiology tape over that area, there are a few extra steps that must take place. First, the therapist or athletic trainer must understand which node groups are intact and which are missing. Then, kinesiology tape must be applied in a manner that bypasses missing node groups . This will prevent the possibility of edema developing in the area with missing node groups. Other precautions include: skin sensitivity, skin health and thickness, and fractures depending on location, stage of healing, and physician recommendations. Some people’s skin does not tolerate the adhesives used in kinesiology tape and they may develop irritation, redness or blisters. Other people, such as the elderly who generally have thinner skin, are more at risk for skin tears or breakdown. Therapists and trainers should take precautions to ensure that the tape is not worn too long or applied with too much stretch to prevent any skin injuries. 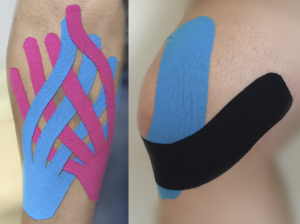 Now, when would kinesiology tape be indicated as a possible treatment method? According to clinical research and common practice standards, kinesiology tape is a viable option for assisting in treating acute injuries, chronic pain, edema or inflammation, tendinitis, or postural issues. It can also be used prior to a strenuous activity or event and during actual performances or competitions            . In fact, kinesiology tape has become rather popular in many sporting arenas as a method of improving performance, preventing injuries, and providing some pain relief during competition. As with any treatment method, kinesiology tape is not meant to be used indefinitely. When used properly, kinesiology tape aids in the recover process, addresses short-term pain relief, and decreases edema. However, the effectiveness of kinesiology tape begins to decrease over time. For example, one study showed that kinesiology tape is effective at reducing pain from shoulder impingement syndrome for a few weeks. The study group received actual kinesiology tape application and the control group received a placebo taping method. Neither group received any additional treatment. After the initial few weeks of taping, there was no difference in long-term pain relief of the study group when compared to the control group . This would indicate that therapists and trainers should consider kinesiology tape as a tool for addressing short-term pain relief. The key is short-term. So when should kinesiology tape be discontinued? Since we know that kinesiology tape creates good short-term results —especially in reducing pain— it should be used in a goal-oriented and specific way to get the best results. Kinesiology tape should be seen as an adjunct to treatment or an aid in getting a client back to training after an injury, not as the treatment . Since kinesiology tape is an effective short-term pain reliever, many therapists and trainers find that it is a good option to allow a client or athlete to begin a course of treatment or training program. For example, if a client is experiencing shoulder pain and is unable to complete certain arm movements, using kinesiology tape on the shoulder girdle can provide enough pain relief for that client to tolerate those movements or exercises that are best suited to address that shoulder issue . Application of kinesiology tape at the initial part of a treatment or training program can provide a good “jump-start” for a client experiencing pain, tendinitis, edema, or postural dysfunction. The therapist or trainer should monitor each client and ensure that the kinesiology tape is still providing effective or positive results. The main thing for therapists and trainers to keep in mind is the need for constant monitoring. Clients should be monitored to ensure that the kinesiology tape is still providing the desired results and that it is not causing any negative results like irritation or skin breakdown. As with any treatment modality or option, therapists and trainers must educate their clients on the basic principles of taping and some simple care procedures to get the best results. Most clients may have heard of or seen kinesiology tape being used during sporting events, but have little understanding of what it actually is and what it can/can’t do. On top of that, medical supply and athletic companies often market new products like kinesiology tape as a “cure-all” or miracle cure and provide little in the way of actual evidence to support claims. Therefore, it becomes the responsibility of the therapists and trainers to provide high-quality information to their clients that helps them minimize any risk and maximize the benefits of using the tape. Kinesiology tape can be worn for 2-5 days at a time, then it should be taken off. The tape can get wet including swimming & showering. Take tape off slowly. Use baby oil or sun screen to help remove if necessary. Remove tape at the first signs of irritation, redness, itching. One of the biggest potential problems or complications from kinesiology tape results from the adhesive that it uses. Most all brands of kinesiology tape use a heat-activated adhesive. This means care should be taken to avoid overheating the tape once it is applied to the skin. Overheating the tape causes it to bind harder to the skin and can cause irritation or skin tears when it comes time to remove it. I once had a client take a very hot shower the day after having kinesiology tape applied to her shoulder, despite the education and warning provided prior to applying it. She noticed some irritation after the shower. When she went to remove the tape, she had redness and irritation under the tape, which left some red marks for the next few days. Luckily, she only experienced some irritation and redness and not any blistering or skin tears as a result of overheating the tape. 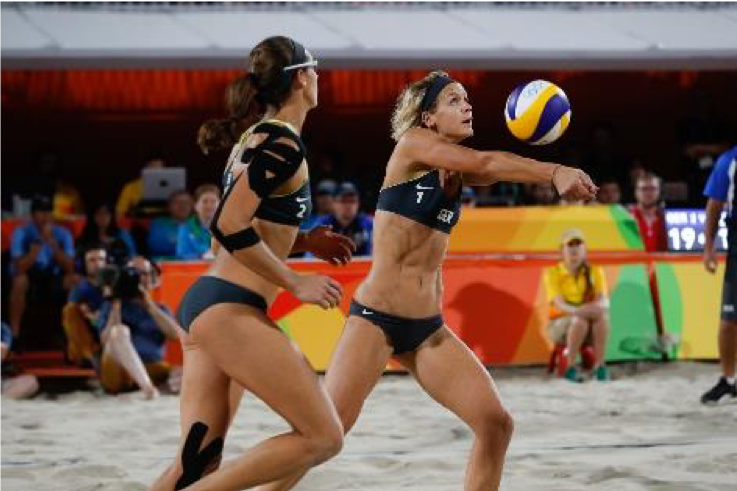 This story illustrates the importance of education prior to the use of kinesiology tape. For further reading about the affects and evidence supporting kinesiology tape, take a look at the clinical research articles listed below.